Are they breakfast or dessert? Who knows (who cares?) 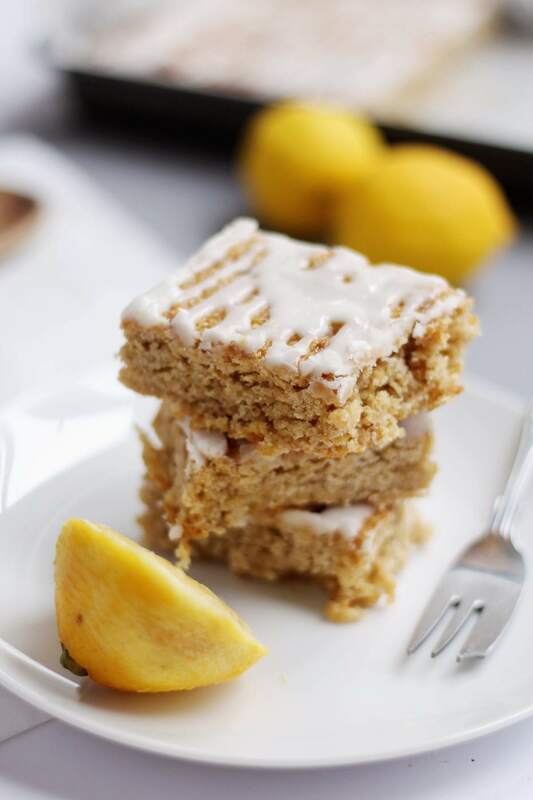 but I do, however, know that these lemon drizzle flapjacks are delicious and they feel almost healthy with the oats and lemon. Practically one of your five a day, right? Right. I was inspired by the delicious Graze Lemon Flapjacks which I picked up the other day and decided that I had to try and replicate. Of course, these are entirely different – they don’t have a yoghurt based drizzle to start with – but they do have the same moreish texture that the guys at Graze do so well. This recipe is easy as anything to do, too, you just melt some stuff then shove it all in a bowl, then in a tin and bake! Mix the drizzle and you’re done – complete in around 35mins. Step One | Preheat oven to 180 C or Gas 4. Melt the butter and sugar together in a pan, then remove from the heat and add all of the other ingredients. Press into a pan lined with baking parchment and bake for 20-25 minutes until lightly golden round the edges then allow to cool. Step Two | For the icing: Sieve the icing into a bowl and squeeze the juice of 1/2 lemon until a think icing forms. You can either add another 1/2 for a ‘drizzle’ style icing (as I did), or you can leave it thicker if you want to pipe it on so it has some height. It’s up to you (or you can leave it off completely). Wait until the flapjack is cool/cold before adding the icing though! Aaand you’re done – not too hard, ey! Let me know if you make this or any of my other bakes. ps. Make sure you enter my Instagram beauty giveaway too!